An office safe is a small investment to make for the security of important documents. Owner-managers are constantly bombarded with warnings about the need to keep electronic data secure. But what about the old problem of keeping paper documents secure? Indeed, with all the talk about backup, cloud security and off-site storage, it is possible to forget those paper documents and records whose originals must be kept, even if electronic copies have been made. In fact, at the end of each workday, temporary documents, backup drives, cash, negotiable instruments as well as confidential documents need to be secured overnight against theft and fire. The protection of these objects has a simple, low-tech answer: an office safe. There are all kinds of safes on the market including wall safes, floor safes, gun safes and the small compact utility safes. Most businesses, however, need something larger than a wall safe but without the inconvenience of a floor safe. 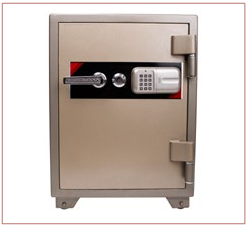 A standalone safe that can be bolted to the floor will suffice for most business purposes. Safe manufacturers recommend against the use of a fire-rated safe to protect valuables because the walls contain the fire-retardant material and are thus easier to cut or drill than the walls of burglary-rated safes. Don’t forget that burglars often take the safe offsite to a place where they have sophisticated tools for cutting and drilling. Composite safes are a very common solution to the risks of both fire and burglary. The quality and price of a burglary-rated safe should depend on the value and number of objects you plan to keep in it over the next decade or so. As your business grows, you do not want to be trying to fit new, important documents into a small, cheap safe! Talk to your insurance broker about the size and rating of the safe you need for the value of the objects you intend to store. A fire-rated safe should be able to protect paper and magnetic media from the effects of heat if the office catches fire. Fires burn at about 700°C. Since the ignition temperature of paper is 233°C and CD/DVDs may start to destruct around 345°C, the safe needs to maintain an internal temperature low enough to protect the contents from ignition for at least an hour. The safe should also have smoke seals around the door that expand when heated and thus protect the data stored inside from smoke damage. The thicker the walls and door of the safe, the more insulation used to protect the contents. The temperature of the test-furnace fire is brought to 926°C and maintained at that temperature for one hour or raised to 1010°C and maintained for two hours. After this time, the safe is allowed to cool. The inside sensors measure the temperature. To meet the ratings, the temperature cannot exceed 176°C, the temperature at which you would roast a chicken in a home oven. Once the safe has cooled sufficiently, it is examined to determine whether the locking system is still workable. The safe is locked and placed into a furnace heated to 1093°C. If there is no explosion after 30 minutes, the safe is rated for one hour. If there is no explosion after 45 minutes, the two-hour rating may be assigned. The safe is then allowed to cool and the locks and parts fastenings are examined to determine whether the safe is still secure. The contents are examined for usability. After the explosion hazard test, the safe is removed from the furnace and within two minutes is dropped 9 metres onto brick riprap on a heavy concrete base. The unit is then examined to see whether the impact bent or ruptured parts that could allow exposure of the insulation or the interior walls. The unit is then allowed to cool. After cooling, the unit is heated again to 843°C for 30 minutes for a one-hour rating or 908°C for 45 minutes for a two-hour rating. After impact, the unit is again examined for deformation, rupture of parts, damaged insulation and any other openings into the interior. Once cooled, the unit’s locking mechanisms and parts fastenings are reexamined for security and the interior examined for visible evidence of undue heat transmission. Whether the safe has been tested for one or two hours is indicated by the labels U.L. Label/Class 350°F (176°C) one hour and Class 350°F two hour.